HGTV describes the 2012 HGTV Dream Home as a "modern rustic ranch home located in picturesque Midway, Utah." In this photo tour of the Dream Home 2012, you can see some of the most beautiful rooms and special features of this year's big giveaway. For an in-depth discussion of the 2012 Dream Home's layout and location, see my article about the HGTV Dream Home 2012's Details. The Dream Home is designed to bring the beauty of the outdoors inside. The color palate mirrors the surroundings, including limestone accents like the nearby mountains, blues from the wide-open skies and river, and greens, browns, and golds from the meadowland around the Home. The artwork within the home is sourced from local artists. In this photograph, you can see the exterior of the Dream Home underneath the blue skies of Utah. Parked out front, you can see the 2012 GMC Terrain SLT2 vehicle, which will also be given away as part of the grand prize. Continue on to enter the Dream Home and see the Entrance Foyer of the HGTV Dream Home 2012 Photo Tour. After you walk through the front door of the 2012 HGTV Dream Home, you'll see the entrance foyer and stairs leading up to the second floor. Down the hallway to the left is the Mud Room, Changing Room, Garage, and Family Room. To the right is the Great Room as well as the First Guest Bedroom and bathroom. And straight ahead is the Kitchen and Dining Room. The walls are painted in neutral tones, which match the stonework in the great room. You'll find abstract Ethan Allen artwork here, as well as a closet and a cozy chair. Continue on to see the Mud Room of the HGTV Dream Home, or go back to see the HGTV Dream Home Exterior. The creators of the 2012 HGTV Dream Home are assuming that the people who end up living in the home are going to spend a lot of time enjoying the variety of outdoor activities that are available in the surrounding area. Hiking, fishing, rafting, and skiing are just a few of the options. And of course, people who spend a lot of time doing outdoor sports tend to come home dirty. That's why HGTV has created this beautiful and practical Mud Room in the 2012 Dream Home. The Mud Room is accessible from the Garage as well as the Front Foyer and leads to the Laundry Room. That means you can walk in and bring your dirty clothes right where they need to go. The floors are made of durable stone tile to stand up to wet, snowy, or muddy shoes. And there's a lot of storage space for sporting equipment, coats, and other outerwear. When you've spent a long day enjoying the great outdoors, sometimes you need to change more than your jacket and your shoes when you get home. That's why the 2012 Dream Home features a changing room, right off the Mud Room and Laundry Room. The Changing Room has outdoor access to the back yard, which leads to the Provo River. So it's stocked with fly fishing supplies if that's a hobby you enjoy. It's also just a few steps away from the Hot Tub Deck, which makes the bathroom with attached shower very useful. The Changing Room also offers storage room for clothing, a comfortable chair, and a very luxurious special feature that you'll see in the next step. Continue on to the Changing Room Sauna of the 2012 Dream Home Photo Tour at Contests, or go back to the Mud Room. The Changing Room of the 2012 HGTV Dream Home is designed for relaxing as well as divesting one's self of dirty clothes. So not only does it have a comfortable chair and a place for hanging a plush bathrobe, it also has a private sauna. Get the feeling of being at a spa in your own home. Continue on with the 2012 Dream Home Photo Tour to see the Great Room of the 2012 HGTV Dream Home, or go back to see the Changing Room. The main gathering space of the 2012 HGTV Dream Home is the Great Room, a beautiful living space that connects the outdoors with the indoors. The Great Room has a two-story cathedral ceiling and expanses of windows to take full advantage of the stunning views. The feeling of the surrounding mountains is reflected in the limestone walls. An indoor gas fireplace will keep you warm and toasty during the cold winters, and plush seating will encourage your family and your guests to curl up and enjoy the amazing views. This is the central room of the 2012 Dream Home, giving you access to the indoor and outdoor rooms. Head out the patio doors to the Outdoor Living and Outdoor Dining area as well as the front patio. Inside, you can reach the Kitchen and Dining Room, the Foyer, or the First Guest Bedroom. Go back to see the Changing Room Sauna, or continue on to the next step in the 2012 HGTV Dream Home Photo Tour, the Kitchen. The 2012 HGTV Dream Home combines the Kitchen and Dining Room areas to maximize space. From this well-outfitted kitchen, you can look out over the Provo River and the mountains as you prepare your meals. The Kitchen features a professional range with a stainless steel hood and storage space underneath. The oven, a microwave, and a warming drawer are stacked on the wall. A large quartz-topped island in the center of the Kitchen features a pull-down faucet, a wine refrigerator, and storage space for the things you cook with every day. A pantry just down the hall gives you plenty of room to store all your cooking equipment and dinnerware. Continue on to see the Dining Room in the 2012 HGTV Dream Home Photo Tour, or go back to view the Great Room. When you dine in the HGTV Dream Home 2012, you'll be surrounded by windows that overlook the home's gorgeous surroundings. Look out over the mountains, meadows, and the Provo River which await just outside your door. The Kitchen is just a few steps away, making it easy to bring dishes to the table. The dining room table is made of pine planks, giving the room a rustic feel. The table is surrounded by two oversized Windsor wooden chairs and six upholstered dining chairs. The artwork in the HGTV Dream Home Dining Room is another way that HGTV brings the outdoors inside. From glass demijohns on the table that play with the sunlight streaming through the windows to oil paintings of snow scenes, you'll feel surrounded by natural beauty. Continue on to see the Family Room on the 2012 HGTV Dream Home Photo Tour, or go back to view the Kitchen. The Family Room of the 2012 HGTV Dream Home is an intimate gathering space where the grand prize winner's family can get together to play board games, watch movies, and enjoy quality time together. The room features a large, plush brown couch which wraps around two walls. The couch expands into a queen-sized sleeper sofa for extra guests. Instead of a traditional coffee table, the Dream Home Family Room contains a number of ottomans, which can also be used for storage or additional seating. There's also a wood dining table surrounded by upholstered chairs, perfect for playing board games. For family movie night, TV viewing, and video game playing, the Dream Home Family Room sports a 54-inch HDTV television. And if you need to get some work done instead, the Family Room also comes with a pair of laptop computers. Patio doors lead outside to one of the many patios which surround the HGTV Dream Home 2012. Children can also escape into a private area just for them, the Family Room Nook. Just a few steps away, stairs lead up to the Second Guest Bedroom. Continue to the Family Room Nook on the 2012 HGTV Dream Home Photo Tour, or go back to view the Dining Room. The Family Room Nook of the 2012 HGTV Dream Home is a whimsical area where children can get away and play on their own. It's reached through a child-sized door from the Family Room, nestled under the stairs leading up to the Second Guest Bedroom. Inside, you'll find a flat-screen TV for relaxing, plus a sleeping area for fun camp-outs in comfy sleeping bags. Continue on to see the Second Guest Bedroom on the 2012 HGTV Dream Home Photo Tour, or go back to see the Family Room. The First Guest Bedroom of the 2012 HGTV Dream Home was designed to make your guests feel like they're staying in a comfortable B&B. The room is furnished in 19th-century style, with antique-like furniture including a Chippendale-style headboard. The First Guest Bedroom is separated from the rest of the first-floor living areas by its own hallway leading from the Great Room. Drapery on the walls and plush carpeting on the floor helps to make this room a quiet and comfortable retreat. There's also a seating area around a picture window, which looks out over the mountain scenery outside. To better enjoy the outdoors, there's also a private entrance to the Outdoor Living Area. The First Guest Bedroom suite has a spa-style bathroom with a separate water closet, a porcelain tile shower stall, and his-and-her sinks. Continue to the Second Guest Bedroom the 2012 HGTV Dream Home Photo Tour, or go back to see the Children's Nook. The Second Guest Bedroom of the 2012 HGTV Dream Home is an Americana-themed guest suite on the second floor of the Dream Home. The room features a Shaker-style bed, giclee on canvas artwork featuring an American flag and patriotic words and symbols, and fabric that subtly reflects an Old West theme. Its location gives guests their privacy. You reach the Second Guest Bedroom from a staircase outside the Mud Room and Family Room, meaning that you can easily come inside from the Garage or the Outdoor Living Areas and get to the bedroom without disturbing anyone. The Second Guest Bedroom also has a Juliet-style balcony where guests can enjoy the outdoor views, a walk-in closet, and a private bath. Continue on to see the Master Bedroom of the 2012 HGTV Dream Home Photo Tour, or go back to see the First Guest Bedroom. The Master Bedroom Suite is a warm and welcoming living area which provides the Dream Home's owners a cozy private retreat. The room features warm brown, copper, and gold tones on the walls and in the furniture's woodwork. You reach the Master Bedroom from stairs in the Entrance Foyer, giving it its own private entry. To get there, you'll go through the Master Sitting Room. The Master Bedroom has a private balcony, allowing the residents to greet the morning with a cup of coffee or a few minutes alone with a good book in the comfortable outdoor seating area. Like all the balconies in the 2012 HGTV Dream Home, this one is surrounded by glass for uninterrupted views and to let the sunlight stream into the home. For those times when you just need to chill out, the Master Bedroom features a flat-screen television ensconced in a wooden cabinet, which also provides media storage space. Continue on to see the Master Sitting Room of the 2012 HGTV Dream Home Photo Tour, or go back to view the Second Guest Bedroom. Between the stairs leading up from the Entrance Foyer and the Master Bedroom itself, the HGTV Dream Home 2012 features a comfortable sitting room. Use this area to work, read, or relax in front of the television. The Master Sitting Room includes a plush couch and upholstered chairs for relaxing. Overhead, there's an ornate chandelier, adding elegance to the room. There's also a beautiful doggy bed for the family pet. The doggy bed includes drawers for storage of toys and treats. The television is housed in a beautiful wooden cabinet, which also includes a drop-down desk for storing and dealing with paperwork or writing. One end of the room ends in sliding barn doors which lead to the Master Bedroom. The other side has a Juliet balcony which overlooks the front of the Dream Home. Take a Virtual Tour of the Master Sitting Room on the HGTV Website. Continue on to see the Master Bathroom on the 2012 HGTV Dream Home Photo Tour. The Master Bathroom of the 2012 HGTV Dream Home sparkles in neutral browns and golds colors. Iridescent glass mosaic tile covers the walls, and natural quartz shines on the his-and-hers vanities. The bathtub nestles under a picture window, which offers views to the northeast. There's also a free-standing shower stall with spa-style fixtures, including three body sprays culminating in a rain-can showerhead. The shower has its own windows, both for ventilation and for the breathtaking views. Between the Master Bathroom and the Master Bedroom are his-and-hers walk-in closets with plenty of room for storage. Take a Virtual Tour of the Master Bathroom on the HGTV Website. Continue on to see the Outdoor Living Room on the 2012 HGTV Dream Home Photo Tour, or go back to see the Master Sitting Room. The 2012 HGTV Dream Home is located in an absolutely beautiful setting, and the design of the home celebrates it. One of the many features that take advantage of the meadows, mountains, and river views surrounding the home is the Outdoor Living Room. The Outdoor Living Room is a cozy seating area with furniture that's resistant to stains and weather damage. The lighting is designed to provide gentle illumination in the nighttime that won't overwhelm the senses. The landscaping around the outdoor living room affords some privacy. Meadow grasses and reeds blend in naturally with the surroundings, while separating the Outdoor Living Room from the yard. There are also curtains that can be brought down to make the living space cozier, adding additional privacy and blocking any wind. A gas fireplace set into the limestone wall adds warmth and beauty to the living area. Boardwalks lead from one deck to the next, to give easy access to other parts of the outdoor area of the 2012 Dream Home. Take a Virtual Tour of the Outdoor Living Room on the HGTV Website. Continue on to see the Outdoor Dining Room on the 2012 HGTV Dream Home Photo Tour, or go back to see the Master Bathroom. If you love a good BQQ, the 2012 HGTV Dream Home Outdoor Dining Room is the perfect location for you. The Outdoor Dining Room is next to the Outdoor Living Room, making it easy to bring your food to your guests while it's still piping hot. It features a 12-foot limestone island with room to hold your grilling equipment and to prep your food. For the actual cooking, there's a gas grill and rotisserie. There's also a warming drawer to keep your food at the perfect temperature. Continue on to see the Hot Tub Deck on the 2012 HGTV Dream Home Photo Tour, or go back to see the Outdoor Living Room. The Hot Tub Duck of the 2012 HGTV Dream Home is designed to be the perfect place for lounging and relaxing. Connected to the other decks by a durable boardwalk, the Hot Tub Deck features a built-in couch and comfy lounge chairs overlooking Mount Timpanogas and the Provo River. Six people can fit in the roomy hot tub, and each can customize the jets to suit their individual preferences. At night, the tub glows softly, adding beautiful lighting to the area. The Hot Tub Deck is only a few steps away from the Changing Room, where Dream Home residents can shower, relax in the Sauna, and dress before entering the main house. Take a Virtual Tour of the Hot Tub Deck on the HGTV Website. Continue on to view the Garage the 2012 HGTV Dream Home Photo Tour, or go back to see the Outdoor Dining Room. The 2012 HGTV Dream Home Garage is designed to not only hold your cars but also provide additional storage space for the stuff that always seems to accumulate over time. There are lockers for sporting gear, tools, and more. The water heater is enclosed by steel doors, and a furnace provides heating in the garage. The floors are made of stained concrete, and chandeliers make the garage look beautiful from the outdoors. From the Garage, you can enter directly into the Entrance Foyer. Take a Virtual Tour of the Garage Interior on the HGTV Website. Continue on to see the Back of the Dream Home on the 2012 HGTV Dream Home Photo Tour, or go back to see the Hot Tub Deck. Before we say goodbye to the HGTV Dream Home 2012, take a look at the back of the home. Here, you'll see the Hot Tub Deck connected by a boardwalk to the Outdoor Living Room. You can see the glass-enclosed Juliet balcony on the second floor. You can catch glimpses of the mountain views. There are many more beautiful features of the 2012 Dream Home that haven't been featured in this Photo Tour. Examples include the Entertainment Deck, where you can lounge next to gas "campfires," the details of nearly all of the bathrooms, the high-performance laundry room, and the gorgeous landscaping including access to public land where you can fly fish, swim, or hike, and more. For even more information, visit HGTV Dream Home Central or read my Full Coverage of the HGTV Dream Home. If you missed any steps, go back to the Beginning of the 2012 HGTV Photo Tour, or use the numbers below to navigate to the rooms you want to see. 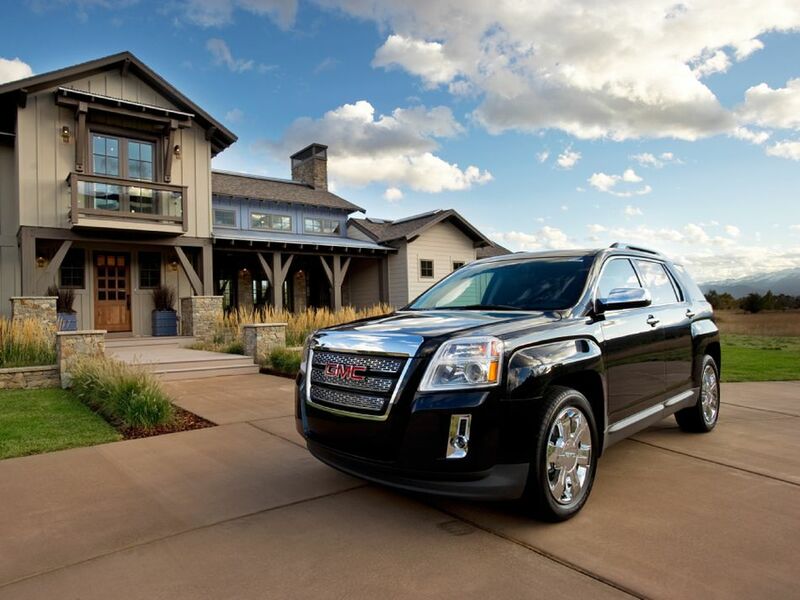 Don't forget that through February 17, 2012, US residents above the age of 21 can Enter to Win the 2012 HGTV Dream Home Sweepstakes, and own this house, the SUV, and $500,000 cash for themselves. That's a prize worth over $2 million, so don't miss your chance to win! Now that you've taken the Photo Tour and seen all the special features of this lovely home for yourself, tell us what you think by rating the 2012 Dream Home.